Interest within JSARS was strong was well, and 10 operators activated multiple HF, VHF, and UHF bands, using CW and voice, analog, and digital modes. A surprise success was the club’s Fusion repeater, which allowed a mobile Fusion radio in the clubhouse to make contacts in North America and elsewhere around the world. In addition to TDOTA activities, stations were set up by the Girl Scout council for most of the activities to earn the ARRL Radio Patch and possibly inspire some interest in getting licensed. Both JSARS and the Girls Scout Council considered TDOTA a big success and plan to repeat it again next year. On Saturday, 3/23/19, members of the Ocean County ARES group embarked on a mission to find the fox, their leader Robert Murdock, WX2NJ. He was hiding somewhere in the confines of the 915 square miles of Ocean County NJ. This is the second time within the last year that the group has performed such a task. The first fox hunt went ok but it took a while to find Bob who was hiding in Jackson at the municipal complex. After the group was given a little help from him that they needed to move from where they were originally searching they coordinated with each other and eventually found him. It was a great learning experience! During the debriefing of the event several ideas came to the table to make the hunt even better. A net control was suggested to do the coordination. This was well received. Also, over the months in between APRS made its usefulness in such an event seem a perfect match. After much planning on how to manage these new ideas would be implemented the group set out for their second adventure. The group met up in two locations. The searchers met at the Ocean County Emergency Operations Center located at Miller Airport in Berkeley Township and the net control operators met at the home of the Section’s Emergency Coordinator, Tom Devine WB2ALJ, in Jackson. Three teams of two operators were formed and net control sent them out in 3 different directions to get initial readings. The teams would go to their location, wait for the fox to transmit (which was every 5 minutes) and get bearings based on their findings. Net control (Matt K3MR, Tim NJ2N & Tom WN2ALJ) plotted the findings on a map and directed the teams to their new locations. It wasn’t that long before Team 1 (Glen KD2FFR & Paul KB2RUV) were sent to the end of Butler Blvd in Bayville for a reading. Later, Bob stated, “Once they were sent there I knew I was found.” They got a bearing north of them and strong. Next Team 2 (Rick N2RPQ & Mike K2MDW) were sent to the Ocean Gate area where they got a full strength reading 17 degrees from their location. After about 5 minutes of driving Team 2 joined Team 1 at Mill Creek Park in Ocean Gate where the fox was hiding! Team 3 (Jon N2LD & Chris K2HVE) who were on their way from Toms River joined the group! The hunt was over except for a debriefing (over pizza of course). We feel we made some significant strides over the first event and most importantly we all had a great time! Just one last thing to note, Bob didn’t make it easier on us either time. He would routinely change his power or antenna to try and throw us off but in the long run we prevailed! Welcome to the website for the Southern New Jersey (SNJ) Section of the American Radio Relay League (ARRL). The SNJ Section is part of the Atlantic Division of the ARRL and is made up of nine counties in the southern part of the state and serves close to 2000 ARRL members within those counties. We will be posting the latest news and updates from within the Section including club events, hamfest information, ARES/RACES updates, Traffic Reports, Youth & Scouting activity and more. In order to keep this site up to date and current we need to hear from you. Send us your club events and articles of other activities you or your group is involved in. Submit your announcements and other articles to us via email. The "SNJ Leadership" link in the top menu will take you to a page listing our staff and links to send them email. The Southern NJ Section of the ARRL welcomes new section manager Tom Preiser, N2XW! Tom previously served as our section's emergency coordinator prior to being elected to his new position. Please welcome Tom as he provides leadership for our section. $2 for 10 or fewer cards in one envelope. 75 cents per ounce, for packages with 21 or more cards. For example, a package containing 1.5 pounds -- 24 ounces, or about 225 cards -- of cards will cost $18. The FCC has placed three Amateur Radio-related Petitions for Rule Making (PRMs) on public notice and has invited comments. Jerry Oxendine, K4KWH, of Gastonia, North Carolina, wants the FCC to clarify that state and localities should have no authority to regulate Amateur Radio with respect to enacting “distracted driving” statutes. In his Petition for Rule Making, now designated as RM-11833, Oxendine contends that such statutes violate FCC rules on scope and operation of equipment by licensees; violate the intent of the FCC and Congress with respect to Amateur Radio’s role in disasters, and hinders emergency operations using mobile equipment. “There is no evidence that the operation of two-way radio has but an insignificant impact on ‘distracted driving,’” Oxendine stated. Such distracted driving statutes usurp the authority of the FCC to regulate Amateur Radio, as well as Citizens Band and Part 90 Land Mobile Service users, Oxendine said in his Petition. Edward C. Borghi, KB2E, of Farmington, New York, has submitted a Petition, now designated as RM-11834, that would prohibit applicants from requesting a vanity call sign outside their call sign district. Exceptions would be made for call signs applied for under rules governing call signs previously held by family members. “In some more populous areas, there are few of the most desirable vanity calls signs available — the 2 and 6 regions for example,” Borghi said. “I see no reason for a licensee to have to compete with out-of-area people for the few 1 × 2 or 2 × 1 or catchy 2 × 3 call signs available in their area of residence,” Borghi told the FCC. Jeffrey Bail, NT1K, of West Springfield, Massachusetts, has submitted a very similar Petition, now designated as RM-11835, asking that the FCC give residential preference in competing applications to applicants whose listed FCC address is within the same district/region as the applied call sign. He cites limited availability and increased demand for 1 × 2 and 2 × 1 call signs. “There are many times a call sign has been awarded to an individual/club who resides outside of the call sign district when there are other people who applied for the same call sign that reside within the district,” he said in his brief petition. 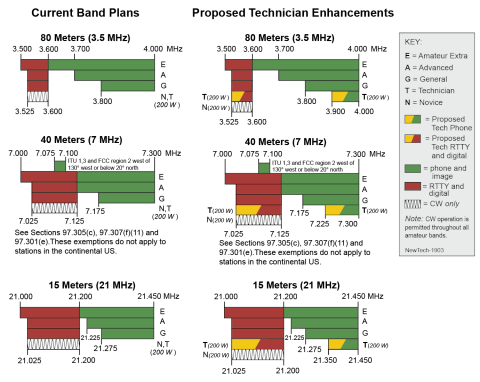 The FCC recently invited public comment on ARRL's 2018 Technician Enhancement Petition for Rule Making (RM-11828). It asks the FCC to expand HF privileges for Technician licensees to include limited phone privileges on 75, 40, and 15 meters, plus RTTY and digital mode privileges on 80, 40, 15, and 10 meters. It does not seek to create a new Amateur Radio license class. Interested parties have 30 days to comment on both proposals.